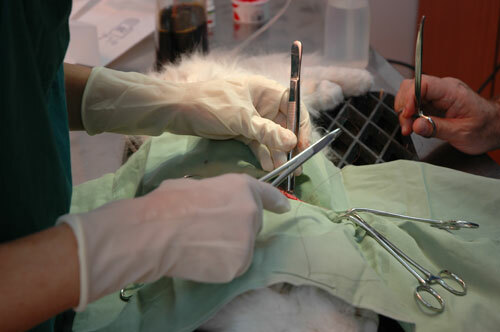 For major procedures, your pet may need to be administered general anaesthesia so that he/she will be unconscious and not feel any pain for the duration of surgery. Some procedures that we routinely perform at our clinic that require general anaesthesia include spays, neuters, dentistry’s, lump removals, gastrointestinal foreign body removal, and more. Modern anaesthesia is generally quite safe, and the extra steps we perform including a full pre-surgical examination and blood work, constant monitoring, maintaining intravenous access, further lower the potential risks involved. We tailor all medications given to each individual patient and what will work best for them. For example, a young healthy patient presenting for a spay would have a different drug protocol then a middle aged, sickly animal presenting for foreign body surgery. A detailed list of monitoring equipment can be found under the “Anaesthesia” section on this page. Generally, we begin most general anaesthesia procedures by administering a sedative to relax and decrease any stress for the patient. The sedation will also include pain control as well, and it is given 15-20 minute before surgery so pain control is on board before painful stimuli is felt. This is usually given intramuscular. An intravenous catheter is then placed for drug and fluid administration for the duration of surgery. Following the intravenous catheter placement we will administer a drug that will relax them enough and bring them to the first level of Anaesthesia in order to place a breathing tube into the trachea. It is through this tube that an anaesthetic gas, Isofluorane, is administered along with oxygen to maintain a state of unconsciousness for the procedure to be performed. The time of Anaesthesia is determined by the time it takes for the procedure. All procedures are different; for example, a cat spay takes approximately 25-45 minutes to perform where a large dog spay may take up to 80 minutes. During the recovery period, your pet is moved to a quiet recovery area where they are monitored closely by our veterinary technicians. The tracheal tube and the intravenous catheter are still in place during this time. Once the animal has regained consciousness enough that they can swallow on their own, the breathing tube is removed. Monitoring continues until they become aware of where they are. When we are happy with their level of consciousness, the catheter is removed and they are left to sleep off the medication while being monitored through a glass window to ensure it is still going smoothly. For the majority of our procedures, we finish before 3PM and they are able to go home the same evening after the owner has spoken with the veterinarian and is aware and comfortable with the home care instructions. Please contact the clinic for more information on our anaesthetic protocols and procedures.